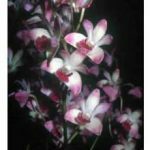 While many Australian native dendrobiums can be considered cold growing, some do better with a little protection and a few, such as Dendrobium bigibbum (the Cooktown orchid), grow well only in a heated glasshouse. The cooler growing species are found at higher altitudes in northern New South Wales, while the colder growing types extend south as far as eastern Victoria. This temperature differential can usually be overcome by providing protection from wind and rain during winter for those species that withstand cool, rather than cold, conditions. 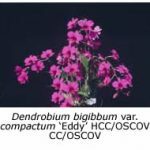 If some basic rules are followed, then good results can be achieved with most of the cool growing species and their hybrids. One factor common to most of the Australian dendrobiums is the need for a rest period over winter. 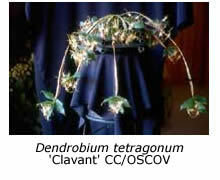 Keeping the plants reasonably dry at this time avoids many health problems arid aids flowering. Good light is another cultural requirement which is essential for both growth and flowering. When combined with adequate air movement and a free-draining potting mix of weathered bark and small river pebbles, or a mount of hardwood or tree-fern, the cultural requirements for most cool growing Australian dendrobiums are met. Dendrobium kingianum is well known to virtually every orchid grower. It is often referred to as the ‘pink rock orchid’ for its habit of growing on rocky outcrops throughout its habitat from northern NSW to Queensland. But it can also be grown in a pot or on a hardwood or tree-fern mount. While D. kingianum is a hardy orchid, it responds well to a little attention, such as the application of weak liquid fertilisers during the growing period (spring to early autumn) and protection from frosts in winter. If the plants are allowed to remain wet during winter, they will respond like soft-cane dendrobiums, and produce keikis (baby plants) instead of flowers. There are many “varieties” of D. kingianum, covering a wide range of plant form and flower colour. While most flowers are pink or purplish red, there are also attractive white varieties, some with purple lips. A few bush-collected forms, such as ‘Albert West’ have good shape and colour but today most have been surpassed by line-bred cultivars of D. kingianum. 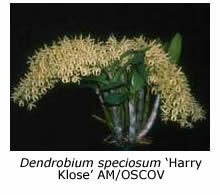 Dendrobium speciosum is another widely grown species. It is found from eastern Victoria to northern Queensland, where it is known as the ‘rock lily’. It’s worth visiting the Brisbane Botanic Gardens in spring just to see huge plants of this spectacular orchid in bloom. This doesn’t mean that we can’t grow it in southern Victoria. 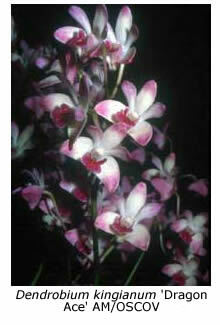 In fact D. speciosum is a tough orchid that will grow almost anywhere, although flowering it every year is a challenge. There are several varieties of D. speciosum, differentiated mainly by pseudobulb size and flower colour. Two varieties ftequently grown are D. speciosum var. speciosum, which has rather long pseudobulbs and yellowish flowers, and D. speciosum var. hillii with cream-coloured flowers. Both varieties seem to flower better in Melbourne if their plants are hung on a sunny and protected north-facing wall. Dendrobium falcorostrum is often referred to as ‘the beech orchid’ for its habit of growing on beech trees in the higher altitude rain forests of New South Wales, particually in the Dorrigo area south-west of Coffs Harbour. It’s a true cold-growing orchid, being frost resistant and flowering better after exposure to cold spells. It grows well mounted on a tree-fern or timber slab and hung in an airy shadehouse. However, it can also be grown successfully in a pot if the compost is free draining. D. falcorostrum responds well to the application of weak liquid fertilisers during the growing season. For plants on mounts, fill a bin with weak fertiliser solution and allow the plant to soak for a few minutes. Although the flowers last only for a fortnight or so, the creamy white, highly-perfumed flowers are among the most attractive of all the Australian dendrobiums. 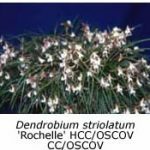 Dendrobium aemulum, the ‘ironbark orchid’, is another good subject for Melbourne conditions, producing attractive sprays of spidery white flowers from its mature pseudobulbs in spring. It should be given winter protection, as it is not frost resistant. It grows best on a bare slab of ironbark, or a hardwood round. 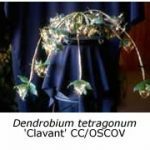 No molly-coddling is required – just tie or wire the plant onto the centre of an ironbark slab and leave it to its own devices. Dendrobium linguiforme (now also known as Dockrillia linguiformis), the ‘tongue orchid’, also produces dainty sprays of small creamy white flowers. It’s best grown on a longer mount of tree fern or hardwood, because of its tendency to climb. Dendrobium pugioniforme (also known as Dockrillia pugioniformis, the ‘dagger orchid’) does particularly well in our area, especially if kept fairly dry during winter. It has a cascading habit, so tie it near the top of its mount. The flowers, produced in spring, are light green in colour. Dendrobium gracilicaule, sometimes called the ‘tiger orchid’, is easy to grow and eventually develops into quite a large plant. Its speckled yellow flowers are individually attractive but their drooping habit lessens the overall impact. 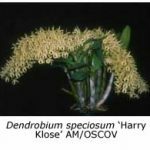 Dendrobium tetragonum is a lovely species that has been used extensively in hybridising (see the following article). It is characterised by tapered pseudobulbs that are thin near the base but thicken into substantial four-sided canes. The spidery green and brown flowers are long lasting. This orchid is generally grown on mounts but in recent times some growers have had good success with pot culture. It needs protection from cold in winter and requires a definite resting period. Dendrobium schoeninum, (also known as Dockrillia schoenina and Dendrobium beckleri), has long, thin, cylindrical pseudobulbs, from which the common name, the ‘pencil orchid’, is derived. This species has adapted to survive long dry spells and should not be over-watered. Its long, pendulous canes necessitate growth on a mount. The cascading creamy white flowers make a great display but transporting a large specimen plant to a show is a challenge. 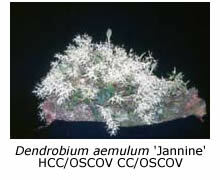 Dendrobium striolatum, (Dockrillia striolata), Dendrobium mortii (D. tenuissimum, Dockrillia mortii ) and Dendrobium teretifolium (Dockrillia teretifolia) are other terete-leafed species which are readily grown on a mount in a well lit position. General Culture. Most but not all of the above species can be grown either in a pot or on a mount. If you use a tree-fern mount, you will need to ensure that it doesn’t eventually become sour, as this will inhibit growth and flowering. Soaking the mount occasionally in lime water helps to neutralise acidity. 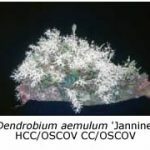 With a few exceptions, such as Dendrobium aemulum, cover the roots with strips of paper bark when tying the plant to its mount, as this helps to retain moisture longer and encourages growth. If you grow your plants in pots, use a mix containing weathered pine bark and some coarse gravel or pebbles, plus a little long-life slow release fertiliser. The mix must be free-draining, kept fairly dry during winter but watered frequently during the growing season. Hybrids. 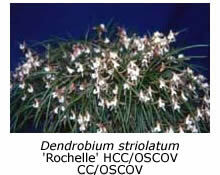 An ever-growing number of Australian native dendrobium hybrids have been produced in recent years. Early popular primary hybrids include D. Delicatum, D. Ellen, D. Hilda Poxon and D. Bardo Rose. But there are hundreds of more complex hybrids now available. 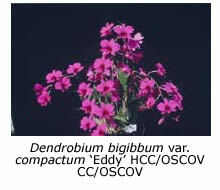 Those bred from cool-growing species and hybrids, using as the other parent the warm-growing species D. bigibbum or its hybrids, will grow under cool conditions. They are currently very popular, because of the bright colours and large size of their flowers. Examples include D. Jonathan’s Glory, D. Anne’s Rainbow Surprise and D. Louise’s Rainbow, bred in Victoria by Issy Klein.